Yet another recurring segment here on this blog, Forgotten Gems will take a look at great speculative fiction books of years past and offer up thoughts on why they’re still worthy of a read. In this inaugural post, I’ll look at one of the great classics of the fantasy genre: Lewis Carroll’s literary nonsense books, Alice in Wonderland and Through the Looking Glass. Let’s see a quick show of hands: Who here is familiar with the story of Alice in Wonderland? Virtually everyone, I see. Alright then, let’s see another show of hands: Who has actually read the two novels? Ok, good, a fair smattering of hands, but far fewer than those who know the story. For those who have gone through life somehow sheltered from any exposure to this classic work of literature, let me provide you with a quick synopsis. Published in 1865 by Charles Lutwidge Dodgson (under the pseudonym Lewis Carroll), Alice in Wonderland starts with young Alice following a white rabbit down a rabbit hole, only to be plunged into a nonsensical fantasy world populated by anthropomorphic animals of questionable mental faculties. Throughout the story, Alice makes numerous somewhat mad acquaintances, eats and drinks various foodstuffs that either grow or shrink her in size, and ultimately encounters the Queen of Hearts, who rules over the magical kingdom with an iron fist. Even though many people have not read the books, they are familiar with them, I would think, primarily due to the classic 1951 Disney adaptation of the novels, which was actually a commercial flop at the time of release. Surprisingly, the movie follows Alice in Wonderland fairly accurately, omitting only a few scenes and adding in a few cherry-picked from Through The Looking Glass, most notably Tweedle-Dum and Tweedle-Dee’s rendition of the “Walrus and the Carpenter” and the inclusion of the poem, “The Jabberwocky.” In fact, the Disney movie has become so iconic that it seems like many subsequent reproductions of the works have been influenced to a greater extent by this movie than by the original novels themselves. For example, Alice’s dress is almost invariably depicted as blue, like in the video game American McGee’s Alice, despite not being mentioned by color in the original manuscript. Despite being a classic, however, Alice in Wonderland doesn’t seem to be a part of many school curriculums. I’m not an educator, but I can come up with a few reasons why that might be the case. For one thing, the book doesn’t really seem to make any moral statements. Not that the book doesn’t encourage thought, which I would argue it certainly does with it’s liberal use of mathematical symbolism and logic puzzle-style dialog, but Alice in Wonderland doesn’t try to make any overt moral or political statements. Also, I can image educators are hesitant to teach Alice in Wonderland because it is a children’s novel that breaks many of the rules of the English language. At the age level when the book might be taught in schools, I would assume that teachers are more concerned with making sure their students know how to use language properly than showing them how to play with it whimsically. So why is Alice in Wonderland worthy of your read? Well for one thing, it’s one of the original works of children’s fantasy, predating J. M. Barrie’s Peter Pan, L. Frank Baum’s The Wizard of Oz, Beatrix Potter’s Peter Rabbit, and Kenneth Grahame’s Wind in the Willows by about 30-40 years. Its imagery has influenced countless artists over the past 150 years, and spawned numerous derivative works. Despite being a children’s novel, it’s well regarded by mathematicians and logicians because of its numerically-oriented themes. And on top of all that, it’s short, clocking in at about 27,000 words, which would take the average reader about 2 hours to read. (Through the Looking Glass clocks in at about 30,000 words). Last but not least, because it was written so very long ago, Alice in Wonderland is in the public domain, meaning that it’s 100% free to read! You can find it on numerous spots throughout the web, or you can download a free e-book via amazon here. Similarly, Through The Looking Glass is also freely available. 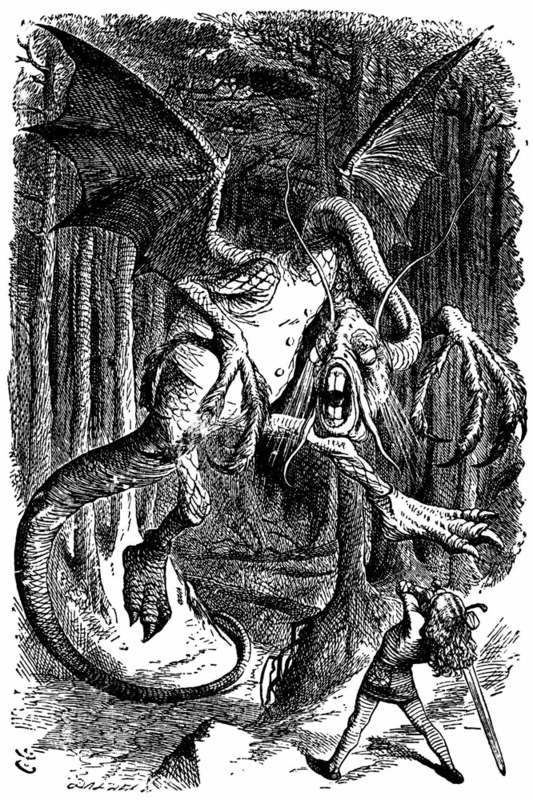 Even better, all the original images illustrated by John Tenniel are also in the public domain, meaning you can find them in e-books, and I can display them on my website to my heart’s content without having to worry about copyright issues. So what do you think? Did you read Alice in Wonderland as a child, or as an adult, or not at all? What are some of your favorite parts of the books? Image credits: John Tenniel [Public domain], via Wikimedia Commons.